Well, we had no need to worry. The idea of the Doctor popping up in one of the parent series' offspring shows could have gone so horribly wrong. What is so striking about the two episodes of The Wedding of Sarah Jane Smith is that everyone gets their due - Sarah and the kids (a proto-Doctor with her own companions) and the Doctor, K9, the Trickster - and writer Gareth Roberts deftly balances all the elements in a breathlessly energetic narrative. What I like about Roberts' approach here is that, although this is yet another view of, and threat to, Sarah Jane's personal life, this one really touches on the parent series' own dynamic of giving the companions a full emotional life. This is something denied to pretty much all the companions in the Classic Series and within the Sarah Jane Adventures Roberts has made a significant effort to transfer the capacity of this new approach to developing companion characters and has applied it to the one of the few original companions that really deserved a fuller life. Episode One explores how Sarah Jane exists beyond the frame of the parent show with the revelation that she has seen other men but that because of her mad life with and without the Doctor she's never really managed to find the love of her life. This was the catalyst that was sparked by School Reunion and cleverly continues to be developed beyond Doctor Who. In this story, Sarah Jane has a shot at a proper relationship and we see her in the throes of her love for Peter Dalton. We also get a very interesting 'what if': if and when Sarah does get married would she completely abandon her activities as protector of Earth? There's a glimpse of this and it's not only unsettling when she initiates total deactivation of Mr. Smith and clears out the attic (yes, she' s under the influence of the Trickster when she does this) but 'and goodbye…to all that' is an intriguing prospect for the character. Why shouldn't a major player in the Whoniverse have the option to lead a thoroughly normal life? It's further underlined when the Trickster shows her a vision of married life with Dalton. Accept the inevitable conclusion that her love for Peter Dalton is very likely to be doomed and then sit back and enjoy what is in all essence a slick screwball comedy in Episode One and a tale of star crossed lovers in Episode Two, both of whom must make huge personal sacrifices to ensure the status is most definitely quo by the end of the story. The comedy elements, a series of deliciously daft slapstick farcical touches, include Luke, Rani and Clyde snooping on Sarah Jane and trying to bluff their way through the appearance of K9, when Dalton arrives at Bannerman Road, closely followed by Rani and Clyde chasing a cartoon alien blob along the streets. Whilst the capers take place in the background, the more serious matter of how Luke will cope with the effort of bonding with his potential new father take centre stage. Nigel Havers is perfect casting as the suave Peter Dalton and Tommy Knight is again brilliant as Luke as he stumbles towards accepting the new man in Sarah's life. Dalton's actually a very tragic figure. It's a sad tale of a man who was supposed to have died but was pulled back from the brink by the hideous Trickster to manipulate Sarah Jane and the timelines. There are some distinctly adult themes in here. The series has certainly always been about the relationship between parents and children. Often it focuses on somewhat dysfunctional families too - Maria and the on/off relationship between Chrissie and Alan, Clyde and his absent father, fatherless Luke and parent-less Sarah Jane to name a few - and with the absence of strong father figures (you wouldn't exactly say Haresh is a powerful authority figure because since his introduction as the school's headmaster he's been hen-pecked into submission by Gita) there's a theme here about children's growing independence from their parents. The monsters in Sarah Jane Adventures are simply symbolic of the fears and anxieties that children must encounter as they inevitably come to terms with their burgeoning adulthood and the separation from their parents. Clearly that most absent of all fathers is the Doctor himself. That great big symbol of authority, the epitome of the law-giver, the fountain of social order heralds his return to Earth via the roar of the TARDIS engines. Quite appropriate that as Peter and Sarah Jane almost complete the exchange of vows, the Doctor bursts into the room and not only attempts to make the marriage null and void but also becomes surrogate father to Luke, Clyde and Rani. 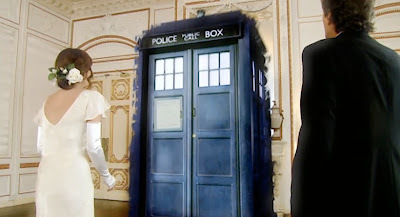 And then the Trickster pops up all dressed in white and vows to possess Sarah Jane Smith 'forever'. The bizarre thought of the Trickster becoming Sarah's husband and Luke's father is an undercurrent here and there's the Oedipal challenge to Luke and to the others to therefore 'deny' the Trickster as his/their father. At the same time the Doctor represents all those qualities that Luke himself must possess, as an adult, to suppress this 'other' father and grow to be as powerful a man as the Doctor. There's such an awful lot of Oedipal stuff rattling around in these two episodes that psychoanalysts could probably set up an all day conference to discuss it. Roberts also wittily subverts the conventions of Classic Who in the way the three teenagers relate to the Doctor as his surrogate companions. They clamour for answers when he gives them a pat 'I'll explain later' to all their questions and after an amusing use of a football rattle he calms them down and offers the answers that everyone wants, including the audience. As the quasi-marriage of Sarah and Peter continues to rumble on in the same dimension, the more powerful marriage of the Doctor and his three temporary companions is cemented as they attempt to understand and unpick the Trickster's temporal schism. The depiction of marriage, especially the strange conjunction between Peter, Sarah and the Trickster is a subtle way of articulating the fears that some children might have about their parents re-marrying or just simply finding a new person to share their life with. It's all about the resistance to, and the reasonable acceptance of, change in the course of family life. With Sarah's constant reference to 'another man' (by extension meaning the Doctor) we are faced again with that idea that Sarah has simply been waiting for the Doctor to come back into her life to give it fulfillment once more. Here he's actually more of reason for divorce if anything else! Sarah is battling with her conscience about three very distinct husband/father figures. No wonder the poor woman can't settle down. But she's also trying to keep the female principle alive, maintaining a symbol of feminine power that could be subjugated by any one of her three husbands/fathers. 'The moment I put that ring on my finger I was your puppet' she gasps at Peter after realising she's trapped. And the Trickster has a very strange line in marriage guidance counseling. As the Doctor detects her movement in time he also asserts his authority as husband/father whilst Roberts has a dig at the series own bete noir about the main character's name. 'Sarah Jane. She doesn't like being called Sarah.' Rani reminds him. 'She does by me.' demands the Doctor. And if we are going to trowel on the significance of marriage, husbands and fathers then the Trickster's splitting up of the temporal schism to prevent the Doctor and his extended family from helping their wife/mother is just articulating the 'divorce' between the feminine unconscious and the male spirit or as the Doctor succinctly puts it, 'The Trickster's separated us'. The Trickster's clever though. He knows about the power of human emotions and Peter's flesh and blood declaration of his love for Sarah Jane is the bait for his nefarious scheme. Unless Sarah Jane does marry Peter then they are all trapped in his Twilight Zone of nowhere. A nightmare form of enforced marital bliss in which Sarah's very identity and purpose are eradicated. Blimey, I bet there's a few women and men in the audience who feel some empathy to her plight. Thankfully we've got the pure artron energy of the TARDIS to give the fella with the big gob a bit of a jolt and the TARDIS symbolically plonking itself directly between Sarah and Peter, with the Doctor, as the quintessence of authority figures, indicating to them both the only way to defeat the Trickster. The final sequence where Sarah has to convince Peter that he must die in order to offer a gift of life is tough stuff for a children's series. That 'I love you but I can't love you' scene truly belongs to Sladen and this is quite probably the most heartfelt she's ever been in the series. Havers is also really rather bloody good too and that 'So here I go' after he flings the wedding ring at the Trickster and his 'I love you Sarah Jane Dalton' as he passes into the great beyond should melt the hardest of hearts. A sad coda, as Sarah is seen to be jilted at the altar and later sits alone in the attic, is turned into joy as the Doctor arrives, more like the strange but kindly uncle who visits now and again, and escorts everyone around the TARDIS. It would be the biggest thrill for children of all ages and Joss Agnew just gets that camera to roam all the way around the interior as you or I would want to ourselves. Lovely. And that final poignant question from Sarah, 'Is this the last time I'm ever going to see you' evokes all kinds of emotions in the audience because we know great change is in the air. 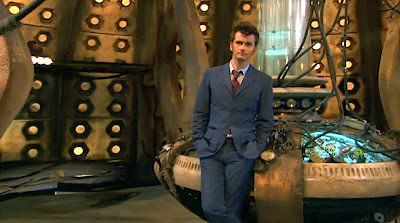 It might very well be the last time she will see him…as David Tennant. 'Don't forget me, Sarah Jane' paraphrases the Tenth of the Fourth and the camera glides away trailing a sense of melancholia as the TARDIS door closes. It dematerialises and leaves our little family looking to the future.